Westbrook's Logan Tibbetts beats Cape defender Elise Mullen. 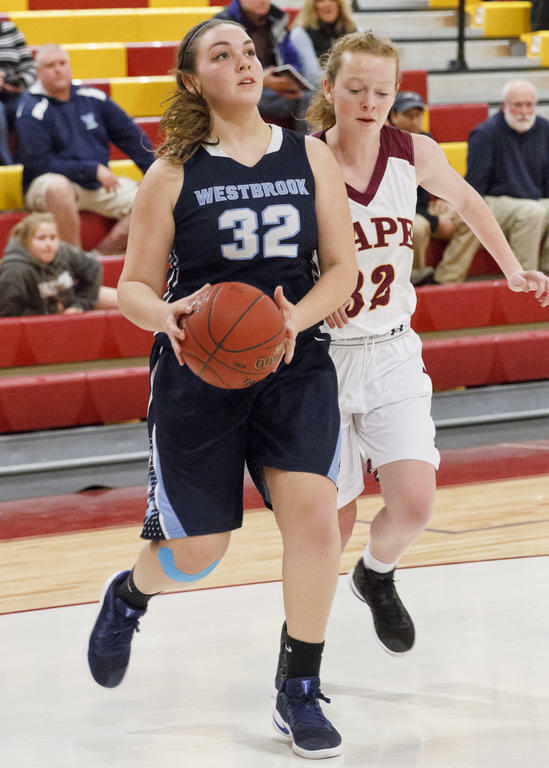 CAPE ELIZABETH – Westbrook’s Mikayla Van Zandt led her girls to victory at Cape on Thursday, Dec. 22, putting up 17 – including eight in the critical third quarter, when the Blazes outpaced their hosts and pulled away in what had been, to that point, a neck-and-neck race. 52-34 the final. The teams traded blows through the first quarter: Van Zandt opened the scoring, but Brooke Harvey answered; Julia Martel hashed two more for the Blazes, but Kelly O’Sullivan answered; and so forth. Westbrooker Julia Symbol closed the stretch with a three to lock the scoreboard up at 11-11. The opponents matched each other through much of the second as well: A Symbol three plus a Van Zandt two put the Blazes up 19-15 midway through the quarter, but Caper Zoe Preble responded with a deuce of deuces to pull her girls even again. A Logan Tibbetts buzzer-beater gave Westbrook the narrow edge, 24-21, at the break. The Blazes roared to life in the third, walloping the home team for 20 points. Symbol – already with two threes to her name on the night, tallied two more – while Van Zandt notched eight on a trio of twos and two from the line. For their part, the Capers managed just seven in the quarter, and thus found themselves deep in a hole as the home stretch approached. The Blazes’ lead proved insurmountable for Cape in the waning minutes: The Capers defended their guests admirably, holding them to a mere eight through the stretch – but they earned just six of their own for the 52-34 result. Beyond Van Zandt’s 17, Symbol contributed 13 for the Blazes (on four threes and a free, no less). Julia Martel added 10, Tibbets five, and Morgan Rice and Nyagoa Bayak two apiece. Harvey and Preble led for Cape, each adding six. The win bumped No. 8 Westbrook to 2-3 on the season; the Blazes slipped to 2-4 vs. Marshwood on Dec. 23rd. They host No. 7 Falmouth (3-2) on Tuesday the 27th and Morse (currently 11th at 1-4) on Tuesday the 3rd. Cape, meanwhile, fell to 0-5. The Capers welcome Fryeburg (fourth at present, 3-2) on the 3rd. Westbrook’s Logan Tibbetts beats Cape defender Elise Mullen. Westbrooker Avery Tucker ascends toward the net; Caper Allison Ingalls defends. The Blazes’ Julia Martel lofts a ball toward the net. Nyagoa Bayak drives through the paint. Mikayla Van Zandt led Westbrook’s attack last Thursday, scoring 17. Zoe Preble drives toward the net for Cape; Westbrooker Julia Symbol defends. Westbrook’s Avery Tucker reels in a rebound and surveys her pass options; Sammi Guerette harangues her from behind.